Harnessing the energies of love. I was up on the roof of the Church of the Epiphany, looking for a pile of unused bricks that had been up there since who knows when. Like lots of things in the church, they were long forgotten relics of an earlier, more exciting time. The bricks were needed to give weight to the Birch branches that are anchoring our prayer ribbons on the plaza outside the church. If Lent is a time of special prayer, why not share it with the world passing by on the sidewalk and street in front of our church? Invite everyone to write a prayer on a ribbon and hang it to fly this way and that way on the wind that swirls around us all! It was a beautiful premature Spring day—you remember it, 75 degrees in February! 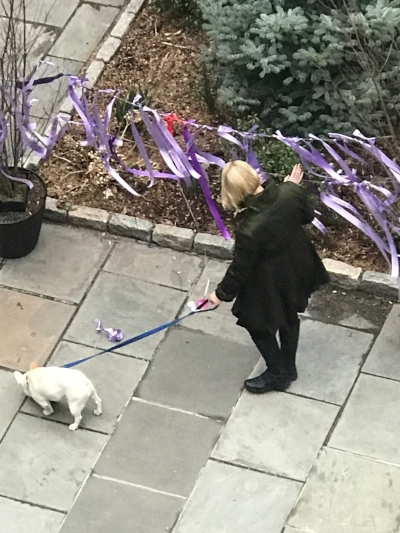 The ribbons were already fluttering down on the plaza, strips of Lent-purple fabric streaming their prayers into the wind. From my God’s eye view on the roof I could look all the way up 2nd Avenue, watching the constant parade of human movement, cars and trucks and pedestrians, everyone going somewhere. It seemed like an amazing amount of energy being expended. Imagine, I thought, if you could somehow direct it towards a really great task, just take all that energy of this pulsating city and focus it to… give hope to those who feel like a failure, to free anyone who is addicted, to give comfort to all who are grieving, to inspire the hearts of each of our children, to help us really see our common brother and sisterhood. That’s what I was, up on the roof overlooking 2nd Avenue—on fire. I had gone up there to get some bricks, but suddenly I didn’t know what came over me. I was all excited about the potential of the world that was in front of me. For a few moments, at least. Why not? Why not harness all that energy and go set the world on fire? I confidently carried a pile of bricks in my arms, carefully negotiating the metal stairs, still flying high from the vision that we could really make it happen. Why not? I made my way through a passageway and emerged onto the sidewalk, the mountain of the church beside me. And almost immediately I heard a young woman’s screams across the street. “My dog, my dog!”, she shouted to anyone ahead of her on the sidewalk. She held a leash in her hand, and she was frantic. She crossed the street in front of the church, and ran right past me and my arms full of bricks. Most of the people on the sidewalk were as startled as I at the unfolding drama, and one person called out to no one in particular, “Someone stole her dog”. What? I said out loud, and I unloaded my heavy cargo onto the plaza. I looked in the direction she ran but I couldn’t see her anywhere, and the sidewalk traffic appeared to have swallowed her and the moment whole. It was like when the fire truck and all its decibal-shattering sirens has passed, life resuming the normal patterns. 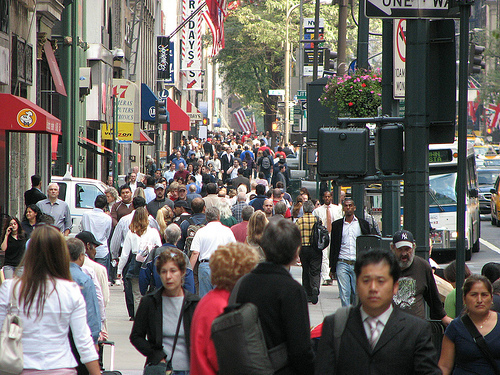 On the sidewalk everything and everyone resumed as before, constant flow of energy going who knows where. I sat down on a wall of the plaza. I don’t know why, but the image of that high school in Florida came to mind: another horrific event of children being robbed of their futures and their peace. In two or three weeks, after the current round of debate and calls for action die out, life will resume its normal patterns, and those images of distraught students and decimated families will fade in our collective conscious. Down here on the sidewalks of our everyday lives, we are numb to it all. We shake our heads in disgust or despair, we shrug our shoulders, we may not like it but we accept it as the norm—it happens, stuff happens, dogs are stolen, another school is invaded, whatever—and life goes on, doesn’t it? There’s not much we can do about it, really, in the end. Right? I’m reading a book about the church. It’s called Divine Renovation. And it gives a brutally honest look at where the Catholic Church is at this time of its existence. The author is a Canadian priest, and he has seen it all. In the book he acknowledges that we are living in a post-Christian world, a world that is sometimes confounding to older Catholics. They feel lost and at times like failures, because their children have walked away from the faith that they found so important. The rules have changed, and he says that “everything they did for their children would have sufficed if it had still been 1956”, when people really believed that they would be condemned forever if they missed Mass. There are certainly a lot of reasons for the indifference or hostility of their children and grandchildren. The priest scandals certainly come to mind, a horror of a similar magnitude to that of a boy who guns down school children. But there are lots of other reasons for the decline of the church. Some of it is because the Church has forgotten that God continues to work in the world, that God continues to speak to us, calling us to be disciples in the world we actually live in. It is true that the Church as an institution has survived 2000 years because it has held fast to its doctrine and its practices, but it has also lost a lot of its life in pursuit of that continuity. And that life, by the way, is Jesus. It is Jesus who shows us the way, and the real truth, and in many ways the Church has forgotten the challenging vision that He has given us. Or perhaps like Peter, James and John we have forgotten the point of the blinding transfiguration atop the mountain. Jesus revealed the height and depth and cosmic implications for all of us if we followed him---it was awesome dazzling, words which sound ridiculously inadequate for what they witnessed. It was meant for them to believe that with Jesus, they could harness the energies of love to build the world that was given to them. With Jesus, they could give hope to everyone who feels a failure, free anyone who is addicted, give comfort to all who are grieving, inspire the hearts of all our children, help us really see our common brother and sisterhood. But those guys missed the point. They saw their own glory in associating with the awesome dazzling Jesus, and they didn’t get it that to follow him meant to give up their egos, their dreams of grandeur, their hope of glory. Following Jesus is never the way to earthly glory. Before the rules changed, the Church lived gloriously significant in the world, but perhaps not so closely with Jesus. As we consider the meaning of the transfiguration, we need to ask ourselves if we are missing the point like Peter, James and John. A desperate woman runs down the sidewalk crying out “my dog, my dog”, a broken young man unloads an assault weapon upon his schoolmates, another church closes its doors forever, and shortly thereafter life resumes its normal patterns. We may not like it but we accept it—stuff happens, whatever, we shrug our shoulders and move on. And Jesus stands up on the rooftop, still calling us to see the awesome dazzling that could truly transform the world. Will we follow him all the way? Will this failing church realize our true calling as disciples of Jesus? Shall we harness for God the energies of love, and then, for a second time in the history of the world, will we discover the fire that brings light and peace and love?